We all want to make informed decisions, right? Well if you are researching potential problems or regulations that you need to consider when installing a wood burner or multi fuel stove in your conservatory, shed or extension, this article will tell you everything that you need to know or that your potential installer should know and be telling you prior to installing a wood burner at your home. After all, we all do some research prior to making an investment like this. So that we can assess which installer to go with and how to choose between the different quotations that you get to install this type of work. Wood burners and multi-fuel stoves are becoming common sight in conservatories, sheds and extensions for good reason. They absolutely change these spaces so that they can be enjoyed all year round in the coldest of climates. Murray and McGregor have installed 100’s of stoves in just about every type of conservatory, shed or extension you can imagine. We absolutely love this type of installation as our customers just can’t believe how much this transforms what is a cold and threatening space in the winter time to the warm ‘winter wonderland’ it becomes with a well installed stove from a professional. This gives us the ultimate satisfaction, we love nothing more than enhancing someone’s lifestyle. However, we realise that there is little or conflicting information out there regarding any potential problems or regulations regarding installations in conservatories, sheds and extensions. This handy guide will mean that you are much more aware of what to look for when investing in a wood burner to enhance an already considerable investment such as a conservatory, shed or extension. Unless you have an existing chimney, which is very rare indeed. This type of installation will be done using a double skinned insulated rigid flue pipe, this is called ‘twin wall flue’. This is expensive, so it is important to consider the factors that will limit the height required for your installation. We can almost guarantee that when considering the installation of a wood burner in a conservatory, shed or extension 90% of the question will come from these five areas. 1. Where should I ‘position my stove’ in the conservatory, shed or extension? Does the proposed position of the stove mean that the flue will be within 2.3 metres of the house? If the flue is less than 2.3 metres from your house the flue height will have to go the full height of the house until it reaches at least 600mmm beyond any point that is within 2.3 metres of the adjacent building. So, if you have a double storey house and the flue position will be within 2.3m of the house, it is most commonly recommended that the stove is positioned so that the flue can be anchored to the outside of the house for this height using extendable wall brackets as illustrated. However, this will obviously cost more to install than a stove that was positioned so that the flue was more than 2.3 metres from the house. Although there is always a minimum flue height from each manufacturer, this ranges between 3.5 metres and 4.5 metres in most cases. This flue route is very common and just the same as many stoves that are installed inside a house and taken through the wall before going up the outside of the house to its terminal. If you were to position the stove so that the flue would be more than 2.3 metres from the house, the flue would only have to be 1 meter above the conservatory roof, which makes it cheaper and easier to install. Although, you must also adhere to the manufacturers specified minimum flue height, this is most commonly 3.5- 4.5 metres in height. An example of such an installation is below. Structural locking bands or a telespopic roof support can be used to make sure that the flue stands up to high winds. It is important to have a survey carried out to establish which would be suitable in your home prior to booking an installation with your local installer or showroom. 2. Do I need planning permission to install a wood burning stove in my conservatory, shed or extension? In nearly every circumstance the answer to this is no! However, there are a few limited cases where this might apply, such as, listed buildings. This should be discussed with you at survey stage with any prospective installer and if in any doubt at all you should contact your local authorities’ planning department or ask your installation company to do so. You may require a building warrant if you were crazy enough to attempt this yourself, we really can’t be stronger in our advice not to do this though. Otherwise a lot of installers and showrooms have HETAS registered installers who can self-certify. This supersedes the need for a building control certificate which will save you anywhere between £200-£350 depending on what6 your local authority charge. 3.How close will the stove be to the wall? This is a ‘distance to combustibles’ question, as are lots of others. So, to explain, all stoves have a distance to combustible materials. This will give a minimum distance to the rear, sides, front and above the stove from any combustible materials such as joists in walls, wooden window sills, door frames and soft furnishings. This is the type of thing that would be discussed at your survey and recommendations can be made based on your own individual circumstances. Fit a rear and/or side heat shield- Many stove manufacturers make a heat shield for some of their range that will lower their distance to combustibles. 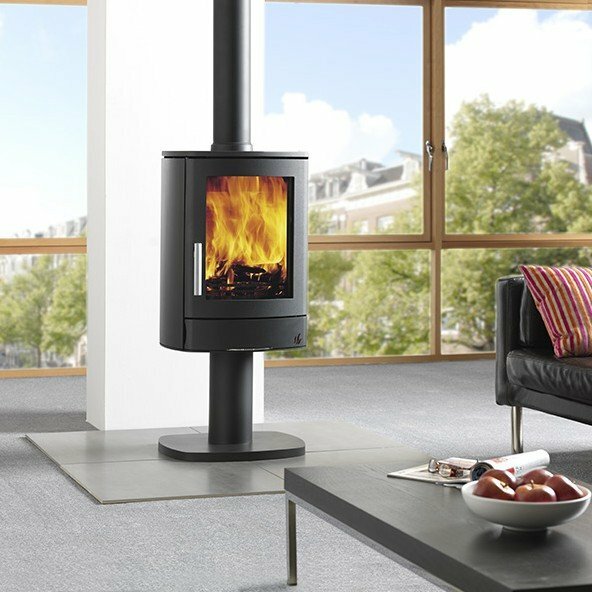 Once fitted you can achieve very low distances, like that of a modern tall stove. The heat shield is fixed to the rear of the stove and creates a secondary barrier and an air gap which allows for this distance to be reduced considerably. Fit a stove with a low distance to combustibles- Most tall modern stoves are perfect for this type of installation as they tend to have much lower distances to combustibles. Where you can sit the stove as close as 50-150mm from combustible wall. The reason that these stoves have such a low distance to combustibles is that they are built in such a way that they are cased in a steel or cast that acts as a heat shield which is integral to the design. Building work where joists are cut out and blocked up- If you see the stove of your dreams but it has high distance to combustibles. Building work can be undertaken such as removing the joists from within a stud wall, this area would be braced and blocked with brick or block. A non-combustible board at the same depth of surrounding Gyproc can be applied to the wall prior to being finished by taping or plastering. A cosmetic hearth- A cosmetic hearth is considered 12mm- 20mm and above. This is most commonly made from a stone such as slate, granite or marble in 20mm. However, there are other options such as glass hearths that are 12mm thick and either clear or smoked in appearance. For a stove to be considered suitable for a cosmetic hearth, it must not transfer heat below the stove beyond 100 degrees Celsius. A constructional hearth- A constructional hearth is a concreate base that must be 125mm thick, this is most commonly found where there is an existing chimney. You will recognise that big block of concrete in front of a chimney breast that is level with the floor joists, right? Well this is a constructional hearth and is always required for open fires, however with wood burning and multi fuel stoves the requirement of a constructional hearth will depend on how much heat is transferred down to the hearth stone. For an installation in a conservatory, shed or extension you should make it a priority to choose a stove that is suitable for a cosmetic hearth. This will minimise the cost and work required prior to installation. 4. How will you seal the roof of my conservatory, shed or extension when installing a wood burning stove? This is quite rightly a big question we get, so how do you make sure that after you make a hole in my roof that no water comes through? Simple! although the answer is different depending on the construction of your roof. These are both what would be considered ‘solid roofs’ which are the same as the type of roof that most people have on their house. We use the same flashings that we would use taking twin wall up through a house. Concrete tile- For a tiled roof we would use a lead-based flashing, the lead base has coverage, that once the tiles are replaced provides a 100% seal to all weathers. There are two main types of lead flashing that can be used for this, let your qualified installer advise which is best for you. Slate roof- An aluminium flashing will normally be used for a slate roof, again this has coverage that will provide a 100% water tight seal and allow the flue to have a storm collar to be fitted which will also direct the flow of water out and away from the area directly above the roof exit. Contact your conservatory company or glazier, to cut a templated hole through the section of glass required. The flashing used here would be an EDPM flashing. This is commonly referred to as a ‘rubber dektite’. These are sealed with sealant and a fastener, the flexible base is virtually compatible with any roofing material such as metal, plastic, asphalt, tile and rubber membrane. The stepped cone design makes it adaptable to almost all pitches and suits all flue diameter sizes from 90mm to 660mm. Remove the required section of glass and replace with a polycarbonate section, this is often the preferred method and means that your installer can simply mark up the position that requires the hole and cut this to the desired size and diameter. This would be finished using an EDPm flashing and sealing as they would on a glass ,corrugated or uPVC roof. These are probably most common and offer the simplest solution. Your installer will just cut the desired hole and use an EDPM flashing to keep you nice and water tight. These are also easy to deal with using a good EDPM flashing despite the up and down contour of this type of roof. All hail to the EDPM flashing, a stove fitter’s friend in many instances! So, as you can see there is a solution to all these problems. Hopefully having this knowledge will help you make the correct choices when deciding on your preferred installer. At Murray and McGregor, we offer a workmanship warranty of 5 years, to ease our customers minds. Most installers will offer a 1 year or 2 year ‘call back’ window. So, it is worth bearing this in mind when choosing the best company to complete your installation. 5. How big should my stove be? When we are asked this, a customer is really asking, what output should my stove be? I feel like writing 5kW and that’s it! However, lets go into it a little more and explain why this makes me smile. I would say that 90% + of the time, this will be the right answer. Most extensions, sheds and conservatories will be adequately heated with a good 5kW ‘nominal’ stove. Nominal output is taken from what might be considered a light load of wood, so in reality there will always be a range of output that you can achieve from a well designed and crafted wood burner. It’s very common to have a range of 3-7kW from a 5kW stove. So, it would have to be one hell of a space to need more than this output. Any reputable installer or showroom will give you the correct advice here. Something to consider would be if you install a stove with a higher output than 5kW. You will have to install a core vent, supplying the room with a constant supply of ‘fresh air'. Most people hear “Cold air” when I explain this and truth be told, they are not wrong. My advice here is simple, you need a 5kW stove and that’s that, although not quite. There may be very rare instances where a house has an enormous orangery ,for example, that may require a larger stove. However this is very rare, if anything, you might need to consider a 3 or 4kW stove so that you are able to stand the heat in a smaller conservatory, shed or extension. Installing a wood burner in your conservatory, shed or extension is a great idea. It really helps connect you to the outside and brings the family together in a way that can’t be achieved by buying a new kitchen or bathroom. It can and should bring a much deeper level of connectivity to yourself and surroundings and maybe, just maybe be the conduit to live your life the way you have always wanted to. We have written an article on the cost of installing a wood burning stove in a conservatory, shed or extension that you can read HERE. I hope that that this article has been useful to your research when considering installing a wood burner. If you think we have missed anything or just want to pick our brains we would love for you to Contact us. We provide a FREE SURVEY across the whole of Scotland where you can benefit from the experience of one of our friendly surveyors, who will give you the options and information to make an informed decision with absolutely no pressure!